Ted Minnis makes Harvard an East Coast power in a West Coast sport. Ted Minnis is Harvard’s winningest water polo coach—his path to Blodgett Pool included a few detours and sharp turns. When the final buzzer sounded last November in the game that won the Harvard men’s water-polo team its first conference championship—and clinched a spot in the NCAA tournament (another first), where the Crimson would go all the way to the Final Four —there was a giant, jubilant pile-up in the pool. Every player jumped in, splashing and hugging and laughing and cheering. At poolside stood their coach, Ted Minnis, who had arrived at Harvard in 2010 with this very moment in mind. And with plans to build an East Coast powerhouse in this West Coast sport. It is an uphill aspiration. In the east, Brown and Princeton are perennially strong, but Harvard had for decades labored in disappointment and futility; in the two seasons before Minnis came, the team won a total of 12 games—while losing 29. Back then, Minnis was a club-team coach in California, and although he often sent players on to the Ivy League, it was almost never to Harvard. When he accepted the Crimson job, he didn’t move right away; first he called a Harvard equipment manager and asked him to send out a couple of shirts with the University crest. Minnis wore them every day for weeks at national competitions. “I’d go home and wash them and put them back on,” he says. “I just wanted to get the Harvard name out there. Like, ‘Hey, we have a water-polo program here. It’s going to be pretty viable, and we’d love for you to start thinking about us.’” That fall, he arrived in Cambridge and moved his stuff into the small cinderblock coach’s office atop the Blodgett Pool bleachers, with windows overlooking the water. 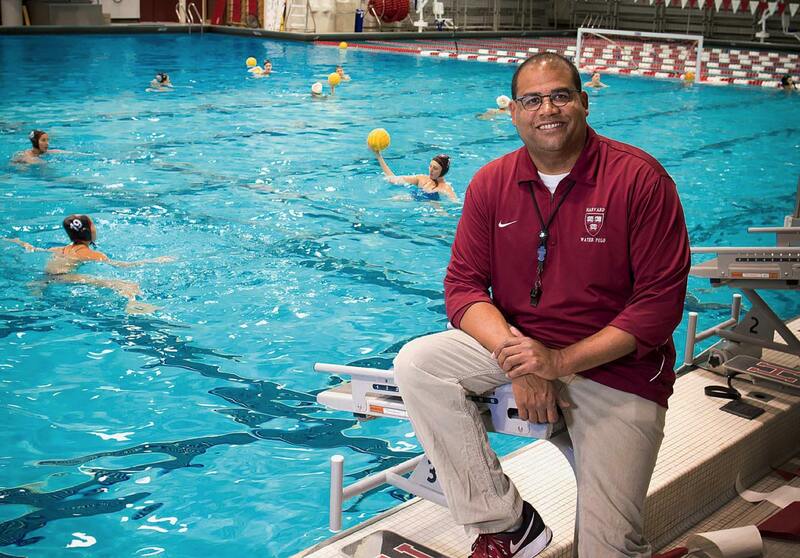 Tall and genial, with big round glasses and an almost bashful smile, Harvard’s winningest water-polo coach is an unlikely figure on campus, not just as a Californian who hadn’t been east much before he moved here, or as an African American in a mostly white sport. Until he took the Harvard job, Minnis had never coached (or played) college water polo. Here, he leads both the men’s and women’s teams: the men play during fall semester, the women during the spring (the 2017 schedule got under way in early February, as this magazine went to press). Both teams draw heavily from the West Coast’s deep well of talent; 11 of 16 men and 10 of 14 women on the current rosters hail from California. And while the men’s 2016 season was historic—they finished with a best-ever 27-7 record—the women have also gained strength, rising steadily if not yet as spectacularly. For the first time, the women have completed back-to-back 20-win seasons, and last year’s 22-10 record was the best finish since 2004. It earned Minnis a coach-of-the-year award from the conference’s northern division, and Yoshi Andersen ’16 became the first player in program history to win all-conference honors all four years. Angie Varona ’20 looks to get the ball over her classmate Julie Harrison. Minnis calls himself a “players’ coach,” and his players call him that, too. Practices are tailored around lab schedules (“We have a lot of science concentrators on our teams,” Minnis explains), and he often eats with students in their dining halls and Houses. “Ted’s the reason a lot of guys are here,” says men’s co-captain Joey Colton ’17. Fifth-year senior Noah Harrison, a leading scorer who finished his Harvard career with 287 goals and 244 steals, succumbed to mononucleosis at the start of his junior year; he decided to take the whole season off and tack on an extra year of school (his major is molecular and cellular biology) so that he could play four full seasons with Minnis and the rest of the team. “I just really wanted to come back,” he says. Minnis’s first love was basketball. Twenty-five years ago, that’s what he would have guessed he’d be coaching now. Water polo was something he picked up after eighth grade because a friend’s dad had played. Minnis was looking for a sport to occupy the school year’s non-basketball months, and he was a swimmer, so he tried water polo. And discovered he was good at it. What’s next? More championships, he hopes. “The main goal” all fall, he says, was to “win conference and bring the first championship to Blodgett Pool and hang the banner.” Now the goal is more of the same.